Trampoline Roofs. Bounce in the Rain with a Trampoline Roof! Atlantic Trampolines play roof offers the solution to be able to use your trampoline regardless of the weather conditions. Our new play roof fits over the existing net poles retaining the safety element of the enclosure netting. You may wish to consider our Trampoline tent if you are looking for a product which is fully enclosed. The play roof not only keeps the trampoline bed dry but it covers the trampoline bed of debris from trees and birds, it offers UV protection against potentially harmful sun rays. 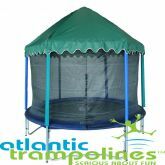 The Atlantic Trampolines play roof will fit all trampolines that are similar to Atlantic Trampolines designs. This purchase is for the trampoline roof only and does not include trampoline, enclosure or other items shown and this product is only suitable for the specified trampoline size. This item is not designed to be used in high winds, please follow the instructions and remove if high winds are forecast.